One of the things I’d like to do here on this blog is tap into some specific senses (touch, taste, smell, sound, sight) about Berkeley as I delve further into my drafts of the novel. This is an exercise I did a few months back that revolved around scent, in an attempt to bring sense memory onto the page. Downstairs, in the big little basement that is home to all of Moe’s new books and used paperbacks, was my home away from home. Whenever I find myself at a rummage sale or library book buyout, inevitably I will press my nose to a mass-market paperback that has seen better days, and the scent of acid-decomposed paper and water-damaged bindings caress me. 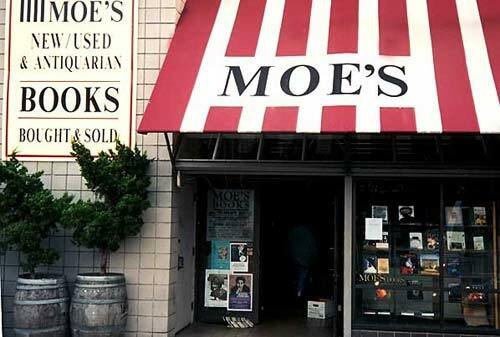 It is familiar, not unpleasant, and full of happy memories of trolling the aisles at Moe’s Books on Telegraph Avenue in Berkeley for hours upon hours. Sometimes, if I had my own used books to sell, I’d take a trade slip instead of cash, and my neck would tilt sideways as my eyes scanned the shelves – and metal carts of yet-to-be-shelved treasures – until a title or author caught my attention and the journey would be set on pause for a moment. Could this be the book that would transport me to another time and place worth my eight to ten hours of nose-between-the-pages intense devotion? Would the fact that another sci-fi fan had languored in a steamy bath or nestled into a worn-down, comfy base of a Sequoia, dissuade me from taking the Tor paperback out of the shelves for keeps? Would the moistness of its pages and the battered shape of its jacket cover turn me off to the wonders and promises of secret wishes fulfilled that may lie encapsulated in the black-on-white words within? Maybe yes and maybe no, depending on the intensity of the permeating odors of the little novel or the level of damage done to the small jewel. But whatever the choice, the search for more adventure, intrigue, horror or otherworldly excitement would continue, my nostrils filled with foreign smells, ancient scents, and the ticket to more olfactory memories and subconscious future pleasures.